The Biome is a new kind of K-3 school, for the next generation - one that offers customized, project based and student-centered learning opportunities with an emphasis on growth mindset and STEAM (Science, Technology, Engineering, Art and Mathematics) education. We are a St. Louis public charter school which opened in August 2015 for K-1 classes, expanding to K-4 in the fall of 2018. 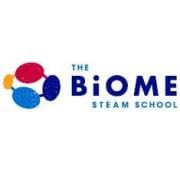 The Biome's STEAM curriculum supports students to become leaders and builders of the future. We engage children in an individualized and challenging educational environment, enriching minds and cultivating confident and creative builders of the future. Would you recommend THE BIOME?